A pretty village that is a favourite with British royal skiers, lift-linked to skiing at Davos and with excellent local facilities. 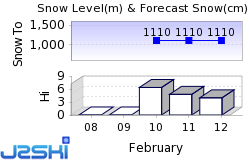 The next notable snow forecast for Klosters is 6cm2in, expected on 23 April, with around 7cm3in forecast over the next 7 days. The Swiss Ski Resort of Klosters has direct access to 307km191 miles of downhill skiing, with 97 marked pistes, served by a total of 52 ski lifts. With ski lifts as high as 2,840m9,318ft, skiing and snowboarding is assured throughout the season. There are several claimants to the title 'Home of Alpine Skiing,' but few with the credentials of the villages scattered around the famous Mount Parsenn in the Swiss Alps. English tourists began appearing in the area in the1860s, wooden skis appeared from Norway in the 1880s (to be copied by local carpenters) and some of the world's first ski lifts went into operation here in the early 1930s. When Sir Arthur Conan Doyle, creator of Sherlock Holmes, visited the area in 1894, he predicted the growth of skiing, I am convinced that the time will come when hundreds of Englishmen will come to Switzerland for the skiing season, he told a contemporary magazine. The great Holmes himself could not have made a more astute presumption...and this was after Conan Doyle had spent a good part of his visit face down in the snow like most first time skiers. You won't find big groups of tourists in Klosters, which appeared way back in 1220AD. The first hotel in the village opened its doors to winter visitors in 1904, but the village hasn't felt much of a need to advertise itself in the usual ways - magazines, travel agents. Indeed the majority of guest beds are in private chalets, often occupied for the whole winter by the rich and the Royal looking for genuine escapism without the glitz (British Prince Charles used to recharge his regal batteries here each winter and still visits frequently). That's not to say that there isn't plenty of room for lesser mortals. Whilst many famous resorts can't resist the temptation to 'maximise their assets', Klosters, located in the Prättigau Valley and with a population of less than 4000 spread between seven hamlets in the area, has secured long term success by controlling its growth. 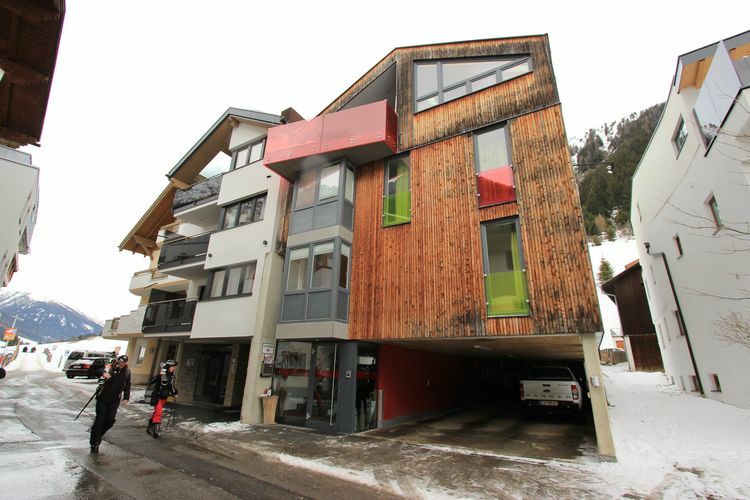 Instead of spending on going 'large', the village has chosen to maintain its picture postcard Swiss architecture in stunning Alpine scenery. At the same time the lift link to Davos and all the kilometres of trails in between ensure that visitors have a truly world class winter sports arena to enjoy, and unlike many big areas, there are challenges for all ability levels here, not just endless intermediate level terrain. Klosters, in common with Davos, St Moritz and several other famous Swiss ski centres, has two sectors known as Klosters Platz and Klosters Dorf. Platz is by far the more lively and centre for most of the hotels, bars, restaurants and shops as well as the cable car link towards Davos. Dorf is the better choice if you're wanting a quiet time. It has the gondola lift to Kloster's own ski area on Madrisa, a free bus service link the two. The longest possible descent in Klosters is 12km7 miles long. Time may have stood still in the village but the skiing has grown apace, with more than 300km (185 miles) of trails on one lift pass, that takes in the neighbouring town of Davos (13km/8 miles away, rail link included on ticket if you don't want to ski it). The range of skiing is tremendous, with more than 30% of the trails categorised black and a reputation for marvellous opportunities off piste. The top lift is at 2844 metres (9330 feet) with Klosters nestled down at 1200 metres (3935 feet) giving a nice healthy vertical drop with relatively snow sure conditions. There are some wonderfully long and varied trails, the greatest being the Weissfluhgipfel run down to Küblis, categorised black/red and 12km (nearly 8 miles) long. The area's lifts are a mixture of cable cars and surface lifts, with few chairs. Beginners have three areas by the village in which to develop their technique with baby lifts for the uphill bit. For everyone else the REGA area pass is the ticket to buy. This cover's Kloster's 'own' ski area on Madrisa, reached by gondola from Klosters Dorf this has seven drag lifts serving largely easy and intermediate runs on sunny south facing slopes above the trees, with a couple of long blacks and reds cutting back down through the forest to the resort. On the other side of the valley the 'Prince Charles' cable car from Klosters Platz successes the Gotschnagrat from where you can either return to Klosters on exciting blacks and reds or head on to Davos. This huge area, the largest single sector on the pass, has skiing for all ability levels and hooks up to some superb off-piste routes that go behind the ski area to Küblis and other hamlets in the area. Cross country skiers have 35km (21 miles) of well prepared trails in the valley offering classic or skating style options and different levels of difficulty between Klosters and the neighbouring village of Serneus. Routes include the Vereina valley and the Novai Alp. A 3km (2 mile) illuminated trail is available for evening treks. Klosters offers good sking, particularly, for Intermediate skiers. Klosters snowboarding park is located on Madrisa where the dedicated 'Duty' Snowboard School are based. Accessed by gondola, all the other lifts on Madrisa are drags. The area is one of the world's leading snowboarding destinations, with four fun parks in total, Davos has held the Snowboarding World Championships recently and stages World Pro Tour events. A third boarding area in the region is on the Jakobshorn where the other half pipe is located as well as a boarder cross and special snowmaking. NOTE:- Lift and Piste openings are always subject to Snow Conditions in Klosters. Klosters is able to make snow, on 30km19 miles of ski runs, with 62 snow cannons. The 52 ski lifts of Klosters are able to uplift 31,000 skiers and snowboarders every hour. Klosters is in the Swiss Alps in Prättigau/Davos, Grisons, Switzerland. The nearest airports to Klosters are St. Gallen-Altenrhein, Friedrichshafen and Zurich. There are eight airports within three hours drive. The Webcams in Klosters are not always up-to-date. Please check the date on the image to ensure you are seeing current snow conditions. Although there are a few dozen bars and four night spots, the evenings in Klosters can rarely be described as 'buzzing' with many of the guests preferring the privacy of their chalets. However there are plenty of lively bars to be found, especially at the weekend. These include the bar at the Wynegg and the establishment in the cellar of the chesa Grischuna. Alternative evening activities include tobogganing, sleigh rides or a trip over to the casino at Davos with its 150 slot machines. Later on the Kir Royal night club at the Silvretta Park is one of the biggest, the Casa Antica will forever be known as the late 'Princess Diana's favourite' and the other two choices are The funny place at the Piz Buin hotel or Rufinis in Klosters Dorf. Another popular venue is Gaudy's Grastiachi at the bottom of the Gotschna station. Other popular Ski Areas near Klosters. Want to ask about skiing and snowboarding in Klosters? Or contact Klosters Tourist Office. Note :- The information on J2Ski concerning Klosters, where not clearly factual, is opinion only and is neither definitive or exhaustive.